Mutations in the human kinase PINK1 (hPINK1) are associated with autosomal recessive early-onset Parkinson's disease (PD). hPINK1 activates Parkin E3 ligase activity, involving phosphorylation of ubiquitin and the Parkin ubiquitin-like (Ubl) domain via as yet poorly understood mechanisms. hPINK1 is unusual amongst kinases due to the presence of three loop insertions of unknown function. We report the structure of Tribolium castaneum PINK1 (TcPINK1), revealing several unique extensions to the canonical protein kinase fold. The third insertion, together with autophosphorylation at residue Ser205, contributes to formation of a bowl-shaped binding site for ubiquitin. We also define a novel structural element within the second insertion that is held together by a distal loop that is critical for TcPINK1 activity. The structure of TcPINK1 explains how PD-linked mutations that lie within the kinase domain result in hPINK1 loss-of-function and provides a platform for the exploration of small molecule modulators of hPINK1. Estimates suggest that more than 10 million people worldwide are living with Parkinson’s disease. This condition, which is incurable, is characterised by the death of brain cells leading to tremors and loss of motor control. So far scientists have been able to link mutations in nearly 20 different genes to Parkinson’s disease. This includes the gene that codes for an enzyme called PINK1. Mutations that affect PINK1 are often seen in people with early-onset Parkinson’s disease and cases that are inherited through families. Changes to PINK1 affects the ability of cells to keep producing energy. Without enough energy to power biochemical processes, affected cells will eventually die. Understanding why PINK1 has this effect and how to prevent it could be helpful in treating Parkinson’s disease. One way to understand the role of PINK1 is to study the three-dimensional structure of the protein to examine how it interacts with other molecules. The PINK1 protein from the flour beetle Tribolium castaneum is easier to produce than human PINK1; this makes it easier to study its structure in the laboratory. Using flour beetle PINK1 and a technique called X-ray crystallography, Kumar, Tamjar, Waddell et al. made a detailed three-dimensional model of the structure of the PINK1 protein. This revealed new details of the structure including a region at one end called the “C-terminal extension”, which is involved in PINK1’s enzyme activities. The structure also highlighted the purposes of two loop regions, one that controls PINK1 activity and one that affects its interactions with other proteins. Further examination of some of these features showed that they are also part of human PINK1 proteins. Using this new protein structure, Kumar et al. went on to examine 20 mutations that are found in patients with Parkinson’s disease and have been able to show the effect that these changes have on PINK1 at a molecular level. It may now be possible to begin designing drugs to prevent or reverse these changes, which could lead to new treatments for Parkinson’s disease. Autosomal recessive inherited loss-of-function mutations in human PTEN-induced kinase 1 (hPINK1), represent the second most frequent cause of early-onset Parkinson’s disease (PD) (Valente et al., 2004). hPINK1 has been proposed to act as a master regulator of mitochondrial quality control, promoting the elimination of damaged mitochondria via autophagy known as mitophagy (McWilliams and Muqit, 2017). In response to mitochondrial depolarisation, hPINK1 is activated and phosphorylates ubiquitin at Serine65 (Ser65). Ser65-phosphorylated ubiquitin then binds to the ubiquitin E3 ligase Parkin with high affinity, serving to prime Parkin for phosphorylation by hPINK1 at an equivalent Ser65 residue that lies within its N-terminal ubiquitin-like domain (Ubl) (Kondapalli et al., 2012; Kazlauskaite et al., 2014; Kane et al., 2014; Koyano et al., 2014). This chain of phosphorylation events stimulates maximal activation of Parkin E3 ligase activity, resulting in ubiquitylation of multiple substrates at the outer mitochondrial membrane and represents a critical upstream step in the induction of mitophagy (McWilliams and Muqit, 2017). The molecular mechanisms of hPINK1 activation and substrate recognition are poorly understood. hPINK1 is distinct from other protein kinases due to the presence of three unique insertions (Ins1, Ins2 and Ins3) within the kinase domain and a C-terminal extension (CTE) of unknown function that bears no homology to any known protein domain (Figure 1A). Nearly, 30 missense and nonsense hPINK1 mutations have been reported in patients worldwide (Deas et al., 2009), located predominantly within the kinase domain or predicted to truncate the CTE. However, the molecular mechanism by which they disrupt hPINK1 catalysis and/or recognition of its physiological substrates ubiquitin and Parkin is unknown. We have previously identified a hPINK1 orthologue in Tribolium castaneum (TcPINK1), which in contrast to human hPINK1, almost entirely lacks the first kinase domain insertion (Woodroof et al., 2011) (Figure 1A). TcPINK1 exhibits constitutive catalytic activity towards ubiquitin, Parkin and generic substrates in vitro (Woodroof et al., 2011; Kazlauskaite et al., 2015). Furthermore, the motor defects of Drosophila PINK1 null flies can be efficiently rescued in vivo by crossing lines that over-express TcPINK1 (Woodroof et al., 2011). Herein, we report the crystal structure of TcPINK1, revealing structural insights into the CTE and kinase domain loop insertions. In particular, we show that the third insertion contributes to formation of a bowl-shaped binding site for ubiquitin that is critical for either TcPINK1 or hPINK1 mediated ubiquitin and Parkin Ubl phosphorylation. Furthermore, we have elaborated an important regulatory role for TcPINK1 autophosphorylation of Serine205 (Ser205), which together with the third insertion, aids in physiological substrate recognition. Overall, these findings provide molecular insights into the mechanisms of hPINK1 kinase activity, ubiquitin substrate recognition, and define the molecular basis of Parkinson’s disease-causing mutations. (A) Domain architecture of TcPINK1 showing kinase domain (150-486); location of Ins2, Ins3, catalytic motif (HRD) and activation loop motifs (DFG; APE) and CTE (487-570). The location of hPINK1 Ins1, which is largely absent in TcPINK1, is indicated. CTE, C-terminal extension; Ins, insertion. Created with IBS (Liu et al., 2015). The boundaries of the crystallisation construct with the mutations introduced is also shown, lower panel. (B) Overall structure of TcPINK1 showing the canonical N-lobe and C-lobe (grey). Catalytic and activation loop motifs are shown in magenta sticks and Mg2+ is shown as a black sphere. Ins2, Ins3 and CTE of TcPINK1 are coloured as in Figure 1A; disordered regions of PINK1 are shown in dashed line; Ins1 of hPINK1 is also shown as part of disordered loop in TcPINK1. (C) Topology diagram of the TcPINK1 structure. Core kinase domain secondary structure elements are shown in grey and indicated with numbers (β-sheet) and letters (α-helices) according to the nomenclature in (Hanks and Hunter, 1995). Non-canonical secondary structure elements (CTE, C-terminal extension; Ins, insertion) are indicated with Roman numerals for Ins2 (cyan), Ins3 (green) and numbering for CTE (blue). Created with TopDraw (Bond, 2003). (D) Ubiquitin phosphorylation assay with full-length TcPINK1 (WT), kinase-inactive D359A mutant (KI), and ATP-binding pocket mutations A194D, K196A and E217K. 2 μg of indicated enzyme was incubated with 2 μM ubiquitin (K63-linked tetraubiquitin) and [γ-32P] ATP for 10 min. Gels were analysed by Coomassie staining (lower panel) and [γ-32P] incorporation visualised by autoradiography (upper panel) followed by Cerenkov counting of substrate bands for quantification (right panel). 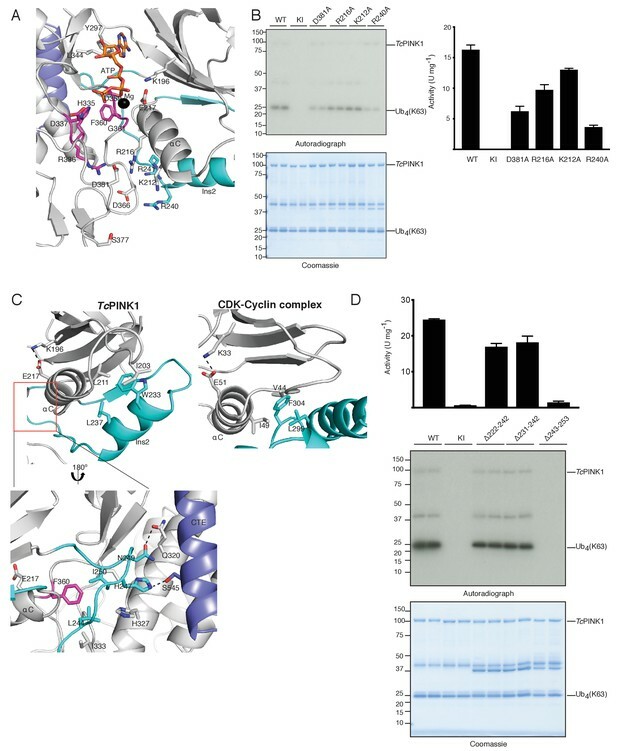 The crystal structure of a catalytically active fragment of TcPINK1 was solved and refined to 2.78 Å using E. coli expression of a cDNA construct encompassing the kinase domain and CTE (Ser150 - Asp570), and possessing mutations to reduce surface entropy (Glu527Ala and Lys528Ala), a 10 amino acid deletion in a large loop (Δ261–270), and a phospho-mimetic mutation (Ser205Glu) (Figure 1A). The crystal structure of TcPINK1 reveals core secondary structure elements of a typical protein kinase domain (Hanks and Hunter, 1995) (Figure 1B,C). As described previously (Woodroof et al., 2011), the N-lobe of the TcPINK1 kinase domain contains three insertions: Lys182–Pro192 (Ins1), Glu221–Ala253 (Ins2), and Leu260–Met288 (Ins3) and in contrast to hPINK1, Ins1 exists as a loop remnant in TcPINK1 (Figure 1A,B). Ins2 forms a small domain containing a βi-strand (222-226) and an αi-helix (231-242) followed by a loop (243-253). Ins3 is disordered and is not included in the final model (Figure 1B,C). Finally, the majority of the TcPINK1 CTE (Ala487–Leu556) is α-helical in nature (Figure 1B,C), and rather than forming a separate domain, is tightly packed on the E, G and H α-helices of the C-lobe of the kinase domain (3747 Å2 buried surface area), supporting previous data on the importance of this region for catalysis (Woodroof et al., 2011). A DALI structure similarity search revealed that Ins2 and the CTE structural elements are unique to TcPINK1 and not found in the almost thousand kinase structures solved to date. Although TcPINK1 was crystallised without ATP, the kinase domain appears to adopt an active, closed conformation, based on the positioning of the αC helix, activation segment conformation, and the ‘in’ position of the DFG motif (Hari et al., 2013; Huse and Kuriyan, 2002; Nolen et al., 2004) (Figure 1B). A model of the ATP was included by superposition with the conformationally similar cAMP dependent protein kinase-ATP complex (RMSD 3.2 Å on 252 equivalent Cα atoms). This suggested that residues Ala194, Lys196, Leu344, Tyr297 and Glu217 are critical for ATP binding (Figure 1—figure supplement 1A). In agreement with this, biochemical analysis revealed that the Ala194Asp, Lys196Ala and Glu217Lys TcPINK1 mutants prevented phosphorylation of its physiological substrates, ubiquitin and the Parkin Ubl domain (Figure 1D, Figure 1—figure supplement 1B). Furthermore, inspection of the structure indicates that the conformation of residues forming two conserved hydrophobic networks (the ‘R-spine’ comprising residues Ile253, Val219, Phe360, His335 and Asp410, and the ‘C-spine’ residues Val176, Leu301, Leu343, Leu344, Leu345, ILe421 and Ile417) is compatible with an active conformation (Kornev et al., 2006, 2008). 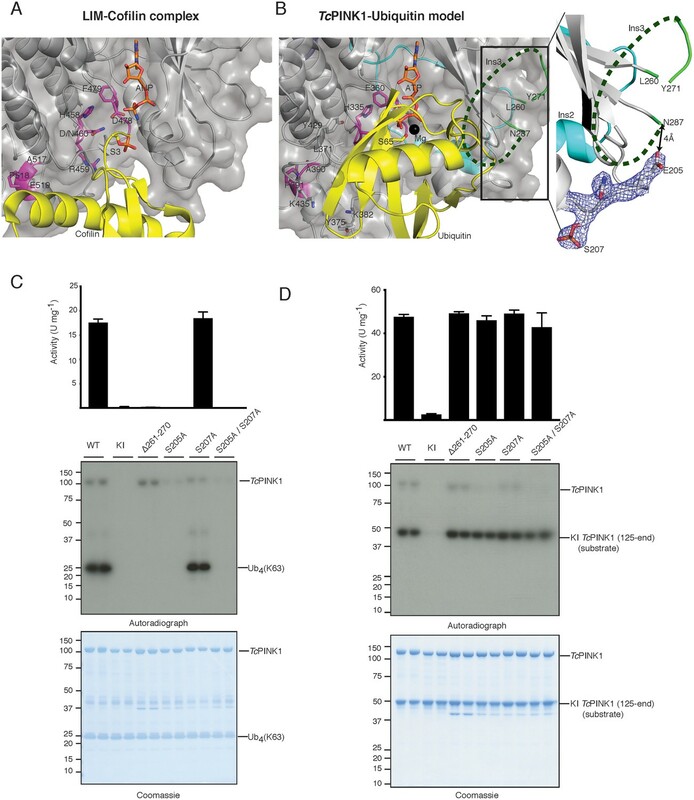 hPINK1-dependent phosphorylation of Ser65 on ubiquitin and the Ubl domain of Parkin is critical for maximal Parkin activation (Wauer et al., 2015; Kumar et al., 2017). However, the regions of hPINK1 that recognize and bind its substrates remain unknown. Via DALI structure similarity search, we identified the LIM kinase-cofilin complex (Hamill et al., 2016) as being conformationally similar to TcPINK1 (RMSD 2.8 Å on 298 equivalenced Cα atoms). Using the phosphopeptide in this complex as an anchor (Figure 2A), we superimposed Ser65 of ubiquitin onto the TcPINK1 active site, resulting in a model of the TcPINK1-ubiquitin complex, free of steric clashes (Figure 2B). Using this model, we explored the key structural elements in TcPINK1 that may contribute to recognition of ubiquitin. Although Ins3 in the TcPINK1 kinase domain is mostly disordered and could not be built as part of the structure; its predicted location places it proximal to the ubiquitin in the model of the complex and therefore we hypothesized that it is likely to contribute a critical role towards substrate recognition and binding. To test this, we deleted 10 residues (residues 261–270, equivalent to the deletion used in the crystallisation construct) of Ins3 and measured TcPINK1 catalytic activity using multiple physiological readouts, including TcPINK1 catalysed phosphorylation of ubiquitin and the Parkin Ubl domain, and transphosphorylation of a kinase-inactive (D359A) TcPINK1 fragment (residues 125–570; His-SUMO cleaved) (Figure 2C,D, Figure 2—figure supplement 1A). Strikingly, deletion of Ins3 resulted in complete loss of ubiquitin or Parkin Ubl phosphorylation, while preserving transphosphorylation activity towards kinase-inactive TcPINK1 (Figure 2C,D, Figure 2—figure supplement 1A). We also found that mutation of key residues Leu371, Tyr375, Lys382 and Lys435 within the canonical substrate binding pocket of kinases resulted in loss of activity against ubiquitin (Figure 2B, Figure 2—figure supplement 1B). Identification of the PINK1 substrate binding bowl. (A) Crystal structure of the LIM kinase substrate complex (pdb id: 5HVK, 18) showing LIM kinase (coloured as TcPINK1 in Figure 1B) and bound substrate cofilin (yellow) with Ser3 (yellow stick) poised in acceptor position. (B) Ubiquitin (yellow) was modelled in TcPINK1 (coloured as in Figure 1B) by superposing Ser3 of cofilin with Ser65 (shown as sticks) of ubiquitin after superposing the TcPINK1 and LIM kinase domains; disordered Ins3 is marked by dashed green line; 2Fo-Fc map, contoured at 1.5σ, corresponding to phosphorylated Ser207 region is shown highlighting the Glu205 position in respect to Asn287 (tail of disordered Ins3), inset. (C) Ubiquitin phosphorylation assay with full-length TcPINK1 (WT), kinase-inactive D359A mutant (KI), insertion three deletion mutant (Δ261–270), S205A and/or S207A mutants in the autophosphorylation sites. 2 µM ubiquitin (K63-linked tetraubiquitin) was used as substrate; assay conditions were similar to Figure 1D. Gels were analysed by Coomassie staining (lower panel) and [γ-32P] incorporation visualised by autoradiography (middle panel) followed by Cerenkov counting of substrate bands for quantification (upper panel). (D) TcPINK1 transphosphorylation assay with full-length TcPINK1 (WT) or various mutants as in Figure 2C. 2 µM of kinase inactive TcPINK1 (125-end) was used as substrate; assay conditions were similar to Figure 1D. Gels were analysed by Coomassie staining (lower panel) and [γ-32P] incorporation visualised by autoradiography (middle panel) followed by Cerenkov counting of substrate bands for quantification (upper panel). We have previously identified multiple autophosphorylation sites for TcPINK1 by mass spectrometry, including Ser205 (equivalent to Ser228 in hPINK1) and Ser207 (equivalent to Ser230 in hPINK1) (Woodroof et al., 2011). Ser207 phosphorylation was also observed in the crystal structure (Figure 2B). Inspection of the structure revealed that Glu205 (the phosphomimetic of Ser205) lies only 4 Å away from the tail (Asn287) of the disordered Ins3 (Figure 2B). We therefore hypothesized that autophosphorylation of Ser205 may influence and/or contribute to ubiquitin recognition and binding mediated by Ins3. Therefore, to test the effect of Ser205 phosphorylation in substrate recognition, we performed parallel assays with ubiquitin, Parkin Ubl domain and transphosphorylation of kinase-inactive TcPINK1 as performed for the Ins3 deletion. Critically Ser205Ala, but not Ser207Ala, prevented ubiquitin and Parkin Ubl phosphorylation while preserving transphosphorylation activity towards kinase-inactive TcPINK1 (Figure 2C,D, Figure 2—figure supplement 1A). Overall, these findings indicate that Ins3, unique to the PINK1 kinases, together with autophosphorylation at Ser205, is critical for ubiquitin and Parkin Ubl phosphorylation and may form part of the ubiquitin/Ubl fold recognition pocket. Multiple lines of evidence suggest that hPINK1 is autoinhibited under basal conditions, including lack of significant activity of hPINK1 in vitro (Woodroof et al., 2011) and the detection of robust activity of hPINK1 in cells only under conditions of mitochondrial depolarization triggering hPINK1 activation via an unknown mechanism (Kondapalli et al., 2012). In contrast to hPINK1, insect orthologues isolated from Drosophila melanogaster, Pediculus humanus corporis and Tribolium castaneum exhibit constitutive catalytic activity in vitro (Woodroof et al., 2011; Wauer et al., 2015). Since the TcPINK1 kinase domain adopts an active conformation in our crystal structure, we sought to exploit this knowledge to probe possible mechanisms of hPINK1 activation. Activation loop phosphorylation is the most common mechanism of protein kinase activation (Hanks and Hunter, 1995), with phosphorylation stabilising the active conformation via electrostatic interaction between the phospho-serine/threonine residue and a basic pocket consisting of the arginine in the HRD motif (Nolen et al., 2004). Previous mass spectrometry analysis of TcPINK1 did not identify activation loop phosphorylation, and furthermore, alanine mutation of a candidate T-loop phosphorylation site residue, Ser377, did not impair TcPINK1 catalytic activity (Woodroof et al., 2011). Consistent with this, we do not observe phosphorylation of Ser377 in the TcPINK1 structure and furthermore, Ser377 is located too distant (12.2 Å) from Arg336 of the HRD motif to form an electrostatic interaction (Figure 3A). Instead the TcPINK1 structure reveals that a highly conserved aspartate (Asp381) within the activation loop, an arginine residue (Arg336) of the HRD motif and an arginine residue (Arg216) in the αC-helix, form an equivalent interaction (Figure 3A), which is further stabilized via interaction with basic residues (Lys212 on the αC-helix; Arg240 and Arg241 in Ins2) and another conserved aspartate (Asp366). To explore which residues were important for TcPINK1 catalysed phosphorylation of its substrates, we investigated point mutants of residues lying within this region. The Asp366Ala TcPINK1 mutant was unstable under our expression conditions and was not assessed. Importantly, our data revealed that mutants in this region, particularly the Asp381Ala and Arg240Ala mutants, were associated with a significant reduction in TcPINK1 catalytic kinase activity towards ubiquitin (Figure 3B). Although Asp381 and Asp366 are conserved in hPINK1, Lys212 and Arg216 form a basic patch on the αC-helix that is conserved among the insect orthologues but not in hPINK1, where the equivalent residues are Asn235 and Gln239. Furthermore, Arg240 and Arg241 of TcPINK1 are replaced by Gly264 and Pro265 in hPINK1, respectively (Figure 3—figure supplement 1A). We hypothesized that these differences in basic residues between TcPINK1 and hPINK1 could explain the lack of recombinant hPINK1 activity. To test this, we generated a mutant of hPINK1 incorporating Asn235Lys/Gln239Arg/Gly264Arg/Pro265Arg substitutions, however, this did not lead to any significant enhancement in hPINK1 activity (data not shown). Ins2 of TcPINK1 adopts a unique conformation. (A) Close up view of active site of TcPINK1 (coloured as in Figure 1B) showing key ionic interactions involving Asp381 of the activation loop with Arg336 of the HRD motif and Arg216 of the αC helix; and Asp366 with Lys212 of the αC helix and Arg240 of Ins2. (B) Ubiquitin phosphorylation assay with full-length TcPINK1 (WT), kinase-inactive D359A mutant (KI), D381A, R216A, K212A and R240A mutants. 2 µM of Ubiquitin (K63-linked tetraubiquitin) was used as substrate; conditions were similar to Figure 1D. Gels were analysed by Coomassie staining (lower panel) and [γ-32P] incorporation visualised by autoradiography (upper panel) followed by Cerenkov counting of substrate bands for quantification (right panel). (C) Structural comparison of TcPINK1 and the CDK-Cyclin complex (pdb id: 5IF1) showing intramolecular interactions between Ins2 (cyan) and αC helix (grey) of TcPINK1 that resemble the intermolecular interactions between CDK (grey) and Cyclin (cyan). The salt bridge between Glu and Lys (shown in sticks) for kinase activation is represented by a dashed line. Interactions between the C-lobe and the distal Ins2 loop are highlighted (Inset). (D) Ubiquitin phosphorylation assay with full-length TcPINK1 (WT), kinase-inactive D359A mutant (KI) and TcPINK1 Ins2 mutants with βi-strand and αi-helix deletion (∆222–242), αi-helix deletion (∆231–242), or distal loop deletion (∆243–253). 2 µM of Ubiquitin (K63-linked tetraubiquitin) was used as substrate, conditions were similar to Figure 1D. Gels were analysed by Coomassie staining (lower panel) and [γ-32P] incorporation visualised by autoradiography (middle panel) followed by Cerenkov counting of substrate bands for quantification (upper panel). 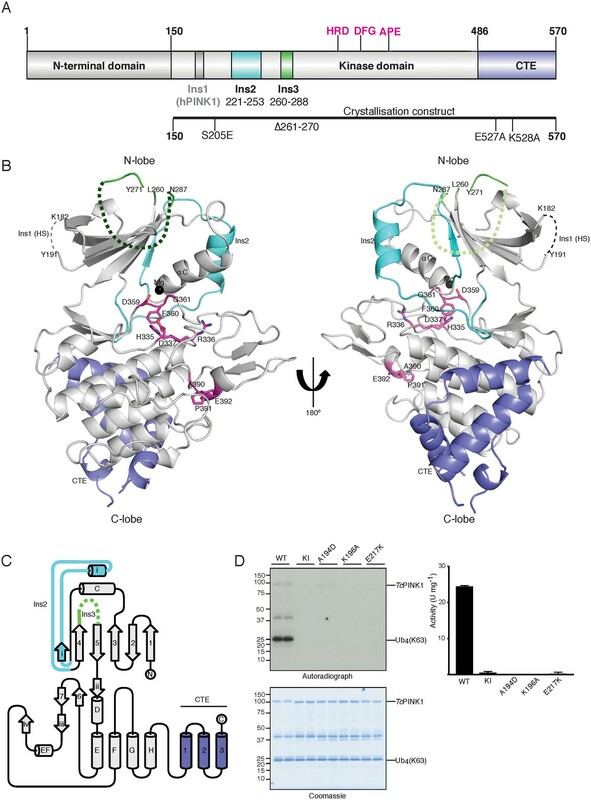 Inspection of the TcPINK1 structure suggests another potential regulatory mechanism of activation through interaction of Ins2 with the αC-helix (1120 Å2 buried surface area) (Figure 3C). This interaction is reminiscent of the activation mechanism of cyclin dependent kinases (CDKs), whereby intermolecular stabilization of the CDK αC-helix occurs due to interactions with the cyclin α5-helix (Figure 3C) (Jeffrey et al., 1995). The TcPINK1 αi-helix (residues 231–242) of Ins2 (residues 221–253) occupies a similar position to cyclin, inducing a displacement of the αC-helix and allowing formation of the key salt bridge between the conserved Glu217 on the αC-helix and the conserved Lys196 on the N-lobe, maintaining the kinase in an active conformation (Figure 3C). Akin to the intermolecular CDK-cyclin interaction, the TcPINK1 αC-helix-αi-helix intramolecular interface also consists of hydrophobic interactions (Figure 3C). Whilst the overall conservation of Ins2 (residues 221–253) is low, the C-terminal/distal region (243-253) of Ins2 remains highly conserved (Figure 3—figure supplement 1A), forming a loop (Ins2 loop) which tethers the proximal region of Ins2 (βi-strand and αi-helix) with the rest of the C-lobe mediated by interactions between His247 and Asn249 of Ins2 and Ser545 of CTE and Gln320 of the C-lobe, respectively. Furthermore, a hydrophobic core is formed between Leu244 and Ile250 of Ins2 with Phe360 of the ‘DFG motif’ and Ile357 (Figure 3C). Interestingly, deletion of the αi-helix (residues 231–242) alone or in combination with the βi-strand (residues 222–242) region of Ins2 does not affect the catalytic activity of TcPINK1. However, deletion of the Ins2 loop (residues 243–253) abolishes the kinase activity of TcPINK1 (Figure 3D, Figure 3—figure supplement 1B). Therefore, our analysis suggests a critical role for the Ins2 loop (243-253) as an anchor, to maintaining the kinase domain in an active state, although the function of the proximal region of Ins2 (222-242) remains to be fully elucidated. Sequence alignment of hPINK1 and TcPINK1 reveals an overall high degree of conservation with the exception of the relative absence of Ins1 in TcPINK1 (Figure 4—figure supplement 1). Therefore, we next explored the structural and functional conservation between insect and human PINK1 in cells expressing hPINK1 whose kinase activity can be stimulated by carbonyl cyanide m-cholorophenylhydrazone (CCCP) that induces mitochondrial depolarization (Kazlauskaite et al., 2015). We transiently expressed wild type hPINK1 or mutants of key ATP-binding residues predicted from the TcPINK1 structure (Figure 1D, Figure 1—figure supplement 1A) into HeLa hPINK1 knockout cells generated by TALEN technology (Narendra et al., 2013). Cells were treated with 10 μM CCCP or DMSO for 3 hr and extracts immunoblotted with phospho-specific antibodies raised against hPINK1 substrates Ser65 Parkin and Ser65 ubiquitin. Consistent with our analysis of TcPINK1 (Figure 1D), we found that Parkin and ubiquitin phosphorylation was abolished in cells expressing mutant A217D, K219A, E240K and L369P forms of hPINK1 upon CCCP stimulation (Figure 4A). This indicates that the ATP-binding pocket is well conserved between TcPINK1 and hPINK1. We next explored whether Ins3, which is well conserved between TcPINK1 and higher species, is critical for ubiquitin and Parkin Ubl recognition by hPINK1. Consistent with TcPINK1, we observed abrogation of phosphorylation of ubiquitin and Parkin in cells expressing hPINK1 harbouring a deletion of Ins3 (Δ285–294 – corresponding to deletion in TcPINK1 Δ261–270) in striking contrast to cells expressing hPINK1 containing a deletion in Ins1 (Δ180–209) or a deletion in the proximal region of Ins2 (Δ245–265 - corresponding to βi-strand and αi-helix of TcPINK1). Overall, these findings indicate that hPINK1 and TcPINK1 share similar mechanisms for substrate recognition and kinase activity, suggesting that the TcPINK1 structure will provide an important framework to direct future studies aimed at structural studies of the hPINK1 enzyme. Conservation of ATP and substrate binding mechanism in hPINK1. (A) hPINK1 knock out HeLa cells transiently co-expressing WT human Parkin and 3xFLAG tagged hPINK1 WT, KI or hPINK1 ATP-binding mutants A217D, K219A, E240K, L369P. A217, K219, E240 and L369 correspond to A194, K196, E217 and L344 of TcPINK1, respectively. Cells were stimulated with 10 μM CCCP or DMSO for 3 hr. Lysates were subjected to immunoblotting as follows: pSer65 Parkin (anti-phospho-Parkin); Parkin (anti-Parkin), pSer65 ubiquitin (anti-phospho-ubiquitin), hPINK1 (anti-FLAG), OPA1 (anti-OPA1) and GAPDH (anti-GAPDH). (B) hPINK1 knock out HeLa cells transiently co-expressing WT human Parkin and 3xFLAG tagged hPINK1 WT, KI or hPINK1 Ins mutants ∆Ins1 (180–209 deletion), ∆Ins2 (245–265 deletion), ∆Ins3 (285-294). Cells were stimulated with 10 μM CCCP or DMSO for 3 hr. Lysates were subjected to immunoblotting as follows: pSer65 Parkin (anti-phospho-Parkin); Parkin (anti-Parkin), pSer65 ubiquitin (anti-phospho-ubiquitin), hPINK1 (anti-FLAG), OPA1 (anti-OPA1) and GAPDH (anti-GAPDH). Mutations in hPINK1 are a leading cause of familial early-onset PD and whilst previous studies have demonstrated that mutations disrupt hPINK1-dependent activity and mitophagy in cells (McWilliams and Muqit, 2017; Deas et al., 2009), very little is known about how these impact hPINK1 structure. Of the approximately thirty reported homozygous or compound heterozygous pathogenic mutations (Deas et al., 2009), twenty are conserved in TcPINK1 (Supplementary file 1). Mapping of these pathogenic mutations onto the structure of TcPINK1 (Figure 5, Supplementary file 1), reveals that they cluster within functionally distinct regions of hPINK1. A major group of PD-associated mutations lie within the ATP-binding pocket including Ala217Asp, Glu240Lys, Ala244Gly and Leu369Pro and perturb interactions with ATP. A second group of mutations that lie in the catalytic motif or activation loop include Gly386Ala, Pro416Arg/Leu and Glu417Gly (Figure 5A,C) result in catalytically inactive hPINK1 (Deas et al., 2009). The His271Gln mutation lies within the critical distal Ins2 loop of hPINK1 (Figure 5A,C), that anchors the proximal Ins2 to the C-lobe (Figure 3C), and has previously been found to abolish catalytic activity in vitro (Woodroof et al., 2011) as well as hPINK1 activity in cells (Okatsu et al., 2012). In contrast, the Gly309Asp (G309D) PD mutation located within Ins3 (Figure 2) would be predicted to perturb hPINK1 and substrate (ubiquitin/Ubl domain of Parkin) interaction as our analysis suggests that Ins3 is required for ubiquitin phosphorylation (Figure 2C, Figure 2—figure supplement 1A). Consistent with this, a previous study showed that the G309D hPINK1 mutant fails to phosphorylate Parkin Ubl in cells (Iguchi et al., 2013) whereas the equivalent TcPINK1 G285D mutant continues to exhibit catalytic activity towards generic and peptide substrates in vitro (Woodroof et al., 2011). The remainder of mutations mainly affects residues critical for structural integrity of hPINK1. In particular, the CTE of TcPINK1 forms a hydrophobic core against the E, G and H helices of the C-lobe (Figure 5B), and a cluster of PD mutations in hPINK1 including Leu539Phe, Leu347Pro and Leu489Pro located in this vicinity suggest the importance of this hydrophobic core (Figure 5B). Attempts to purify soluble protein for a number of point mutants targeting this hydrophobic interface were unsuccessful, underscoring the importance of this hydrophobic core which explains loss of kinase activity of TcPINK1 upon CTE deletion in previous studies (Woodroof et al., 2011). Although it has previously been suggested that CTE may be important for dimerization (Okatsu et al., 2013), we did not find evidence for a functional dimer in our TcPINK1 purification procedures or crystal structure. Spatial map of Parkinson’s disease (PD) linked mutations within hPINK1. (A) Mapping of PD mutations onto the TcPINK1 structure (coloured as in Figure 1B). Pathogenic hPINK1 disease mutant residues are shown in red sticks; disease mutants in the disordered region (represented by dashed line) of Ins3 are labelled in red characters. (B) Interface of the CTE and C-lobe of TcPINK1 showing the hydrophobic core (shown in grey or blue) of the TcPINK1 kinase domain. hPINK1 PD mutations in the vicinity of the hydrophobic core are shown in red sticks. (C) Location of hPINK1 PD mutations (marked with red lines) on the primary TcPINK1 sequence. hPINK1 mutations are shown in parenthesis. Overall the TcPINK1 structure provides molecular insights into the structural regulation of hPINK1 and in particular defines functional roles for its unique loop insertions in ubiquitin substrate recognition and catalytic activity. The structure provides clarity on the impact of loss of function disease-associated mutations, which may stimulate future drug discovery efforts for both familial and idiopathic PD. BL21 codon plus (DES) RIPL (Stratagene) were transformed with pET15 6HIS SUMO TcPINK1S150-D570 ΔI261-L270 S205E E527A K528A (available from MRC PPU Reagents and Services: http://mrcppureagents.dundee.ac.uk). For overexpression, 1 L of Terrific broth (TB) medium was inoculated with 10 ml of overnight culture. Cultures were propagated in a shaking incubator (Infors HT) at 37°C and 200 rpm until OD600 ~0.6–0.8. Temperature was then reduced to 16°C upon which cultures were supplemented with 100 µM IPTG and grown overnight. Cells were harvested by centrifugation at 4000 rpm for 25 min (Beckman coulter J6-Mi centrifuge). Cell pellets were carefully resuspended in ~4 × cell volume of lysis buffer (50 mM EPPS pH 8.6, 500 mM NaCl, 5% glycerol, 3% sucrose, 5 mM imidazole) at 12°C by gentle shaking (150 rpm). Before lysis, 0.5 mM TCEP pH 7.5 (from Apollo Scientific, United Kingdom), 0.1 mM Pefabloc (Sigma Aldrich, United Kingdom), and 10 µM Leupeptin (Apollo Scientific) were added to the mixture. Cells were then lysed by sonication (6 × 10 s pulses at 10 s intervals, 45% amplitude) and to remove the cell debris, the cell lysates were centrifuged at 28,000 rpm for 25 min at 4°C (Beckman Avanti J-30 I centrifuge). For protein purification, the supernatant was incubated with Nickel sepharose beads previously equilibrated with 10 CV binding buffer (50 mM EPPS pH 8.6, 500 mM NaCl, 5% glycerol, 3% sucrose, 5 mM imidazole, 0.5 mM TCEP, pH 7.5) for 1 hr at 4°C on a roller. Thereafter, the beads were collected by filtration and washed thoroughly (800 ml −1 L) with binding buffer containing 30 mM imidazole. The protein was then eluted from the beads using the elution buffer (50 mM EPPS pH 8.6, 500 mM NaCl, 5% glycerol, 3% sucrose, 400 mM imidazole, 0.5 mM TCEP, pH 7.5). The eluted protein was mixed with His-SENP1 protease (1 mg of His-SENP1 per 25 mg of TcPINK1) to cleave off the SUMO tag and dialyzed into 30 mM HEPES pH 7.5, 500 mM NaCl, 5% glycerol, 3% sucrose, 0.25 mM TCEP, pH 7.5 at 4°C overnight (using 3.5 kDa SnakeSkin dialysis tubing; Thermo Fisher). The dialyzed mixture was subjected to negative pull down using Nickel sepharose resin to remove the His-SUMO and TcPINK1 was concentrated to ~5 ml. Reductive methylation of lysine residues was then performed (as described in Hampton Research Protocols) before loading onto a gel filtration column (HiLoad Superdex 16/600, GE Healthcare), previously equilibrated with the gel filtration buffer (25 mM HEPES, pH 7.5, 300 mM NaCl, 5% glycerol, 3% sucrose, 2 mM TCEP, pH 7.5). Following gel filtration, methylated TcPINK1 was concentrated to 9 mg/ml flash frozen in liquid nitrogen and stored at −80°C for further use. For overexpression, purification and methylation of selenomethionine (SeMet) TcPINK1 derivatives, an identical protocol was used (using MD12-500 kit from Molecular Dimensions to incorporate selenomethionine). Native and selenomethionine derivatised TcPINK1 was crystallised using 5 mg/ml of protein mixing with 200 mM MgCl2, 100 mM HEPES pH 7.0, 20% PEG 6000 and 200 mM MgCl2 or 100 mM HEPES pH 7.5, 25% PEG 3350 and 200 mM MgCl2, respectively, under vapor diffusion sitting drop method. Crystals were flash frozen using 20% of glycerol with mother liquor. Data were collected at ESRF, with a SeMet anomalous data set collected at the selenium absorption edge. Selenomethionine-incorporated and native crystals diffracted to 3.4 Å and 2.8 Å, respectively. Data were processed using XDS (Kabsch, 2014) and AIMLESS (Winn et al., 2011). SAD phasing was performed on the anomalous data set using CRANK2 in the CCP4 program suite. Phases were improved by iterative cycles of manual model building and refinement using Coot (Emsley and Cowtan, 2004) and Refmac (Winn et al., 2011), respectively (Table 1). Ramachandran values were calculated using MolProbity (Chen et al., 2010) with 94% of residues in the most favored regions. Diffraction data and refinement statistics. Single crystals were used for structure determination. Full length wild-type and mutant TcPINK1 were expressed in E. coli (BL21-codonplus) as maltose-binding protein fusion proteins. Cells were grown at 37°C, induced with 250 μM IPTG at OD600 0.6 and were further grown at 16°C for 16 hr. Cells were pelleted at 4000 r.p.m., and then lysed by sonication in lysis buffer. Lysates were clarified by centrifugation at 30 000 g for 30 min at 4°C followed by incubation with 1 ml per litre of culture of amylose resin for 1.5 hr at 4°C. The resin was washed thoroughly in wash buffer, then equilibration buffer, and proteins were then eluted. Proteins were dialysed overnight at 4°C into storage buffer, snap-frozen and stored at −80°C until use. Kinase assay substrates (ubiquitin, Parkin Ubl, and TcPINK1 125-end D359A) were expressed as 6His-SUMO fusion proteins using the same conditions. Cleared lysate was incubated with 1 ml Ni2+-NTA resin/litre of culture for 1.5 hr at 4°C. The resin was washed thoroughly in wash buffer, then equilibration buffer, and proteins were then eluted. Proteins were dialysed overnight at 4°C into storage buffer. 6His-SUMO tags were cleaved by the addition of SENP1 at a ratio of 1:10 protease:tagged-protein. Tag-cleaved protein was purified by thorough incubation with Ni2+-NTA resin, and then snap-frozen and stored at −80°C until further use. Reactions were set up in a volume of 40 μl, using 2 μg/30 ng of E. coli-expressed TcPINK1 and 2 μM of substrate, in 50 mM Tris–HCl (pH 7.5), 0.1 mM EGTA, 10 mM MgCl2, 2 mM DTT and 0.1 mM [γ-32P] ATP (approx. 500 cpm pmol−1). Assays were incubated at 30°C with shaking at 1050 r.p.m. and terminated after 10 min by addition of SDS sample loading buffer. The reaction mixtures were then resolved by SDS–PAGE. Proteins were detected by Coomassie staining, and gels were imaged using an Epson scanner and dried completely using a gel dryer (Bio-Rad). Incorporation of [γ-32P] ATP into substrates was analysed by autoradiography using Amersham hyperfilm. Quantification of [γ-32P] incorporation into substrates was performed by Cerenkov counting of respective SDS-PAGE gel bands. TcPINK1 and indicated mutants were expressed as maltose-binding protein fusion proteins: lysis buffer contained 50 mM Tris–HCl (pH 7.5), 150 mM NaCl, 1 mM EDTA, 1 mM EGTA, 5% (v/v) glycerol, 1% (v/v) Triton X-100, 0.1% (v/v) 2-mercaptoethanol, 1 mM benzamidine and 0.1 mM PMSF. Wash buffer contained 50 mM Tris–HCl (pH 7.5), 500 mM NaCl, 0.1 mM EGTA, 5% (v/v) glycerol, 0.03% (v/v) Brij-35, 0.1% (v/v) 2-mercaptoethanol, 1 mM benzamidine and 0.1 mM PMSF. Equilibration buffer contained 50 mM Tris–HCl (pH 7.5), 150 mM NaCl, 0.1 mM EGTA, 5% (v/v) glycerol, 0.03% (v/v) Brij-35, 0.1% (v/v) 2-mercaptoethanol, 1 mM benzamidine and 0.1 mM PMSF. Elution buffer was equilibration buffer with the addition of 12 mM maltose. Storage buffer was equilibration buffer with the addition of 0.27 M sucrose, and glycerol, PMSF and benzamidine were omitted. Ubiquitin K63 tetramer was expressed as previously described (Kristariyanto et al., 2015). Lysis buffer contained 50 mM Tris–HCl (pH 7.5), 150 mM NaCl, 5% (v/v) glycerol, 20 mM imidazole, 1% (v/v) Triton X-100, 0.1% (v/v) 2-mercaptoethanol, 1 mM benzamidine and 0.1 mM PMSF. Wash buffer contained 50 mM Tris–HCl (pH 7.5), 500 mM NaCl, 5% (v/v) glycerol, 20 mM imidazole, 0.03% (v/v) Brij-35, 0.1% (v/v) 2-mercaptoethanol, 1 mM benzamidine and 0.1 mM PMSF. Equilibration buffer contained 50 mM Tris–HCl (pH 7.5), 150 mM NaCl, 5% (v/v) glycerol, 0.03% (v/v) Brij-35, 0.1% (v/v) 2-mercaptoethanol, 1 mM benzamidine and 0.1 mM PMSF. Elution buffer was equilibration buffer with the addition of 200 mM imidazole. Storage buffer was equilibration buffer with the addition of 0.27 M sucrose, and glycerol–PMSF and benzamidine were omitted. HeLa hPINK1 knockout cell lines were obtained from Richard Youle (NIH) and were cultured using DMEM (Dulbecco's modified Eagle's medium) supplemented with 10% FBS (foetal bovine serum), 2 mM L-glutamine, 100 U/mL penicillin and 0.1 mg/mL streptomycin. Cells were transiently transfected with WT Parkin and 3xFLAG tagged PINK1 using polyethylene method. Mitochondria were uncoupled using 10 μM CCCP (Sigma) dissolved in DMSO for 3 hr. 1% Triton solubilized lysates were resolved on SDS-PAGE, and wet transferred onto nitrocellulose membranes. Membranes were blocked with 5% BSA followed by overnight incubation with the indicated antibodies in 5% BSA or milk in TBST at four degrees. Membranes were incubated with HRP-conjugated secondary antibodies diluted (1: 10,000) in 1X TBST with 5% BSA for 1 hr at room temperature followed by exposure with ECL, pSer65 Parkin membranes were incubated with secondary antibodies conjugated with LI-COR IRDye at 1:10,000 dilution in 1X TBST with 5% BSA. List of antibodies used in the present study are mentioned in Supplementary file 2. FASEB Journal : Official Publication of the Federation of American Societies for Experimental Biology 9:576–596. Journal of Biological Chemistry 288:22019–22032. Nature Structural & Molecular Biology 24:475–483. Current Opinion in Cell Biology 45:83–91. Journal of Biological Chemistry 288:36372–36384. Thank you for submitting your article "Structure and activation mechanism of the Parkinson's disease kinase PINK1" for consideration by eLife. Your article has been reviewed by three peer reviewers, and the evaluation has been overseen by Tony Hunter as the Senior and Reviewing Editor. The following individuals involved in review of your submission have agreed to reveal their identity: Kalle Gehring (Reviewer #1); Stefan Knapp (Reviewer #2). The reviewers all found this description of a first structure of a member of the PINK1 family of kinases to represent an exciting advance in the field, but had a number of suggestions for improvement and reorganization. 1) You need to stress in the title, Abstract and throughout the paper that the structure is that of TcPINK1. Otherwise, the reader may be led to believe that the paper describes the structure of the human PINK1 catalytic domain. In addition, since you have not established the mechanism of activation of human PINK1, "activation mechanism" should be removed from the title. 2) Since TcPINK1 is constitutively active, you should be more cautious about what this catalytic domain structure tells us about the activation mechanism of human PINK1, i.e. you need to state/discuss more explicitly what regulatory mechanisms derived from the structure of TcPINK1 are relevant to hPINK1 and what aspects of hPINK1 regulation might be different. 3) Your proposal that Ins2 activates the catalytic domain through a cyclin-like interaction with the C-helix is intriguing and novel, but, although you carried out mutagenesis experiments to define the ATP-binding pocket, you did not conduct any direct mutagenesis experiments to verify that an interaction between Ins2 and the C-helix is important for activity of the catalytic domain. As you indicate, you have previously reported that the H271Q mutation, which lies in Ins2, reduces TcPINK1 kinase activity (Woodroof et al., 2011), but there is no discussion of why this mutation should be deleterious, and the H271 residue and its contacts are not shown in Figure 4. Ideally, you need to analyze the effects of mutating a C-helix interface residue in Ins2 predicted by your structure to be inactivating to bolster the conclusion that Ins2 activates TcPINK1 by a cyclin-like contact with the C-helix. 4) Both human and TcPINK1 have been shown to be activated by phosphorylation of Ser228 (human)/Ser205 (TcPINK1), but this site is not discussed at all. Instead, you describe the contacts and supposed regulatory importance of the Ins2 region but with no indication of how those contacts would be modified as part of a regulatory mechanism. The argument in the Results and Discussion that human PINK1 is regulated and TcPINK1 constitutive is unproven. An equally plausible explanation is that the human protein is unstable when purified and/or inherently less active. Related to this, the statement that the authors were "we were unable to confirm […] by mutagenesis" the significance of the amino acid differences between human and TcPINK1 (subsection “Mechanisms of PINK1 autoactivation”) needs to be better explained. Was it a negative result or was the experiment unsuccessful? eLife revise decision letters normally do not provide the full reviews, but only a summary of the main issues that need to be addressed. However, in this case, we have decided to provide the three reviews in full so that you can see all the concerns, and revise the paper accordingly. Kumar and colleagues report the structure of PINK1, a kinase involved in mitochondrial autophagy and a recessive early-onset form of Parkinson's disease. The discovery three years ago of phosphorylation of ubiquitin by PINK1 has generated intense interest in the kinase and its potential as a drug target. The authors have determined the structure of an insect orthologue and modeled its interaction with its substrates, ubiquitin and ATP. Using the structure, they have generated a mutant that is defective for ubiquitin phosphorylation but retains activity for autophosphorylation and myelin basic protein. The main problem with the manuscript is its presentation. The figures are poorly conceived and repetitive and the order of presentation of the results is confusing. From a scientific standpoint, the article is outstanding and a significant, major contribution to the field. 2) As an alternative to the current organization, the authors might consider putting all of the enzymatic kinase assays into a single figure. My suggestion would be the structure in Figure 1 with location of PD mutations, Figure 3—figure supplement 1A, and possibly the modeled ATP. Figure 2 could be the kinase assays and Figure 3 could present the comparison with LIMK1 and docking of ubiquitin. This should help to remove some of the duplications. For example, Figure 1A and 4C would be combined and only shown once. 3) Move Table 1 to the supplemental material and Figure S3 should be part of the kinase activity figure in the main manuscript. 4) Add paragraph breaks to the Introduction to improve the legibility. 5) The text in the Results and Discussion should explain the use S205E phosphomimetic referencing the Woodroof 2011 paper. I found it curious that there was no discussion of the importance of this residue for kinase activity when it reportedly has a greater effect on activity than loss of S207. E205 is shown in the example electron density but no reference is made to its interactions with other residues. S207 and E205 might be hidden somewhere in Figure 1/2 but I couldn't find them. 6) The explanation of the activation of PINK1 in the subsection “Mechanisms of PINK1 autoactivation” was confusing. Since the TcPINK1 kinase domain adopts an active conformation, it wasn't clear how to interpret the intermolecular interactions listed. Do the authors expect that these will be lost in human PINK1? If so, how is human PINK1 activated? The kinase assays show TcPINK1 autophosphorylates. Where is the phosphorylation site? Does this regulate its activity or is TcPINK1 constitutively active? 7) The authors should expand the discussion of the relationship of PINK1 to other kinases. 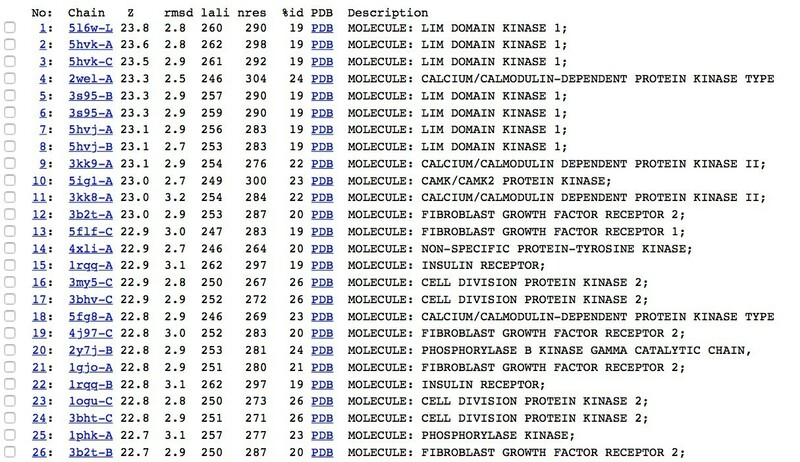 Sequence analysis (BLAST) shows much greater similarity to calmodulin kinases than LIMK1 so the observation of LIMK1 as the top hit is unexpected. What were the other DALI hits? Is LIMK1 really the best model for positioning of the ATP? 8) In the figure legend for Figure 4C, it isn't clear which are confirmed effects of the mutations and which are predicted. The paper by Kumar et al. 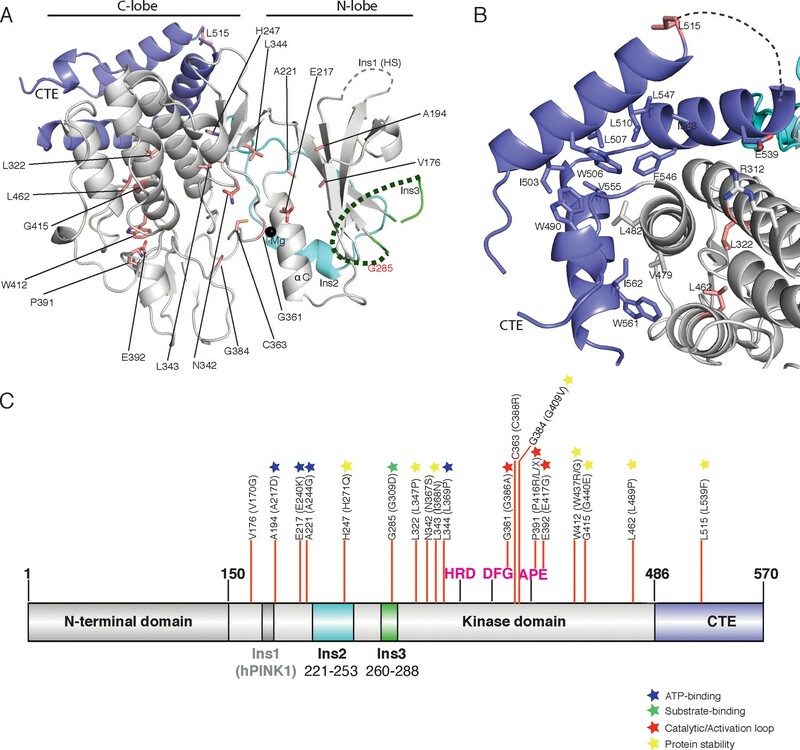 entitled "Structure and activation mechanism of the Parkinson's disease kinase PINK1"reports the crystal structure of the catalytic and C-terminal domain of Tribolium castaneum homologue of the kinase PINK1. The structure revealed a canonical catalytic domain fold with a helical C-terminal domain. From the three inserts present in human PINK1 the first insert is missing in TcPINK1, the second insert was deleted and the third insert was present but unstructured. The authors report that similar to the cyclin interaction in CDKs an α helical motif stabilizes the active state. In addition, the disordered third insert motif seems to be important for substrate recognition (ubiquitin) and a molecular model of the PINK1 substrate interaction was constructed based on the recently published LIMK substrate (cofilin) complex. Finally the authors analyze the effect of mutations found in PD revealing that many mutations are in positions that are important for PINK1 catalytic function such as the ATP binding pocket. Human PINK1 is a structurally very diverse kinase with a strong link to the development of PD. To date structural studies on the human enzyme have been hampered due to difficulties expressing stable and large amounts of this unusual kinase. A structural model that provides insights into the regulation of PINK1, the role of its unusual inserts and the consequences of PD mutations is therefore very welcome and informative. However, I had to read until the end of the Introduction to find out that the presented structure is actually based on the TcPINK1 sequence. I think therefore that this should be highlighted in the title, Abstract and impact statement. Also a more detailed sequence comparison would be helpful to judge how this model can help to provide insight on the regulation of the human enzyme (maybe as supplemental material). How high is the overall sequence homology? In addition, the deletion of loop regions and mutations aiding crystallization should be annotated in Figure 1. It seems that there are clear differences in the activation of TcPINK and human PINK1. For instance the first large insert is missing. Is this insert required for human PINK1 function? In addition, TcPINK1 is constitutively active whereas the human enzyme may require activation. While certain aspects of PINK1 regulation (e.g. the substrate recognition) may be shared between TcPINK1 and hPINK1 there seems to be clear differences in the regulation of this enzyme in higher eukaryotes. Despite these limitations I think however that the presented structural data are very useful and informative and based on the interested in the role of PINK1 in PD the article may trigger functional studies on the human enzyme and it will be widely read. My recommendation is therefore to simply make the paper more transparent and to highlight the limitation of the current structural model more clearly in the revised version. This manuscript reports the crystal structure of PINK1, a Ser/Thr protein kinase involved in regulation (phosphorylation) of ubiquitin. The authors crystallized a T. castaneum orthologue of human PINK1 (TcPINK1 and hPINK1), the construct of which included, in addition to the kinase domain, N-terminal domains Ins2 and Ins3 and C-terminal domain CTE. The structure was determined at 2.8 Å resolution (not 2.7 Å, as reported in Results) and reveals the structure of the kinase domain, Ins2, and the CTE. The kinase domain is observed to be in an active state, with the alphaC-beta3 salt bridge intact and a DFG-in activation loop configuration. Ins2 and the CTE make interactions with the kinase domain that are probably important for kinase regulation. Contrary to their claim in the Title and Abstract, the authors do not really reveal the activation mechanisms of hPINK1. They state that TcPINK1 is active in vitro (the crystal structure evidently shows why), but hPINK1 is not active in vitro. Why hPINK1 is not active and how it becomes activated are not explored. 1) The authors speculate from the TcPINK1 crystal structure that Ins2 activates the kinase domain via a cyclin-CDK mechanism (involving αC). While this seems quite plausible based on the structure (and is arguably the most important feature of the structure), the authors did not perform any mutagenesis experiments to verify this. 2) The authors speculate that Ins3, which is just upstream of the kinase domain and which is disordered in their crystal structure, interacts with ubiquitin to provide substrate specificity. To test this, they make a 10-residue deletion construct of Ins3 in TcPINK1 and show that ubiquitin phosphorylation is abrogated, whereas MBP phosphorylation (non-specific substrate, negative control) is less affected. As shown in Figure 3B, though, MBP phosphorylation is down over 5-fold, indicating that the Ins3 deletion is probably affecting PINK1 stability, in addition to affecting (possibly) specific ubiquitin phosphorylation. A generic peptide substrate might serve as a better negative control. We thank reviewers/editors for pointing this out. Exploiting the TcPINK1 structure, we have now included cell based experimental analysis of hPINK1 to show that the ATP-binding and ubiquitin substrate recognition mechanisms are conserved between hPINK1 and TcPINK1 (Figure 4). Employing cell based assays of hPINK1 we show that Ins1 (that is not conserved in TcPINK1) does not play any role in the regulation of hPINK1-directed phosphorylation of substrates (Figure 4B). We have included new functional data showing the importance of the basic patch of residues around the catalytic pocket of TcPINK1 for activation (Figure 3A and B). These residues are not conserved in hPINK1 and we have speculatively engineered a TcPINK1-like basic patch into hPINK1, although this does not appear to lead to an increase of hPINK1 kinase activity (Author response image 1). As there may be technical reasons for the lack of activity particularly with stability and folding of recombinant hPINK1 (that was also raised by reviewers), we have not included these data in the main manuscript. As requested we have removed "activation mechanism" from the title and Results. The new title is “Structure of PINK1 and mechanism of Parkinson’s disease associated mutations”. We have now amended the Abstract to clearly state that the structure is of TcPINK1 to avoid any confusion. Incorporation of basic residues around the catalytic pocket, identified from TcPINK1 structure (Figure 3A), do not result in an active hPINK1 enzyme. We now demonstrate interactions between H247 (H271 in hPINK1) and the C-terminal extension (CTE). We further highlight that H247 lies within a highly conserved C-terminal loop of Ins2 (residues 243-253) (Figure 3C, Figure 3—figure supplement 1A). Mutational analysis of distinct truncations of Ins2 indicate that this C-terminal loop (243-253) of Ins2, where H247 resides, is crucial for PINK1 activity (Figure 3D, Figure 3—figure supplement 1B). Interestingly we find that deletion of the αi-helix (231-242) alone or the combined βi-strand and αi-helix (222-242) region of Ins2 does not significantly affect the kinase activity of TcPINK1 (Figure 3D) or hPINK1 (Figure 4B) under the assay conditions used. Therefore, the role of the proximal region of Ins2 remains uncertain and requires further investigation. We have substantially revised the text to explain these findings. We thank the reviewers and editor for directing us to further investigate and discuss the role of Ser205 phosphorylation. We now include new data on Ser205 that has revealed an exciting and functionally important contribution of Ser205 phosphorylation in PINK1 activity towards substrates. Structural analysis indicates that Ser205 phosphorylation forms a bowl with Ins3 (Figure 2B), which plays a crucial role in ubiquitin recognition and phosphorylation (Figure 2C, D and Figure 2—figure supplement 1A). We have also studied the role of another phosphorylation site, Ser207, that was captured in the crystal structure, but this lies on the surface and apparently does not affect PINK1 phosphorylation of ubiquitin (Figure 2B, C, D and Figure 2—figure supplement 1A). We have included a detailed sequence alignment between TcPINK1 and hPINK1 (Figure 4—figure supplement 1), alongside our previous multiple sequence alignment between various organism highlighting important regions around the αC-helix, Ins2 and the activation loop (Figure 3—figure supplement 1A). We hypothesized that these basic residues differences could explain the lack of recombinant hPINK1 activity and have addressed this experimentally as detailed in our response above to points 1 and 2. We agree with the reviewer that an “equally plausible explanation is that the human protein is unstable when purified and/or inherently less active”. Therefore, we have amended the manuscript to remove references to the activation mechanism of hPINK1. […] The main problem with the manuscript is its presentation. The figures are poorly conceived and repetitive and the order of presentation of the results is confusing. From a scientific standpoint, the article is outstanding and a significant, major contribution to the field. We have now modelled ATP-γ-S instead of AMP-PNP. We have also made all other necessary changes to improve the presentation quality. However, we have refrained from grouping all the mutational assay results together and instead placed this next to the structural data as we think this will allow readers to understand the appropriate context of the assay data. We have addressed these points separately above in the response to the Editor’s comments (comments 1-4). We appreciate that calmodulin kinase is more identical to PINK1 at the sequence level, however, according to Z score in DALI, LIM Kinase is the most structurally similar kinase, please see the details of DALI search in Author response image 2. In Figure 4C (Figure 5C in the revised manuscript), the predicted effects are on the basis of the region in the structure where the mutation is located; and the functional role of that region e.g. activation loop, catalytic motif, ATP binding pocket, substrate binding pocket, Ins3 or hydrophobic core of the protein. […] Human PINK1 is a structurally very diverse kinase with a strong link to the development of PD. To date structural studies on the human enzyme have been hampered due to difficulties expressing stable and large amounts of this unusual kinase. A structural model that provides insights into the regulation of PINK1, the role of its unusual inserts and the consequences of PD mutations is therefore very welcome and informative. However, I had to read until the end of the Introduction to find out that the presented structure is actually based on the TcPINK1 sequence. I think therefore that this should be highlighted in the title, Abstract and impact statement. Also a more detailed sequence comparison would be helpful to judge how this model can help to provide insight on the regulation of the human enzyme (maybe as supplemental material). How high is the overall sequence homology? In addition, the deletion of loop regions and mutations aiding crystallization should be annotated in Figure 1. We have addressed these points separately above in the response to the Editor’s comments (comments 1-4) including change of title, highlighting that the study is based upon TcPINK1 in the Abstract, inclusion of detailed sequence comparison (Figure 4—figure supplement 1) and describing the crystallisation construct in Figure 1. We agree with the reviewer’s comments that the reasons for the inactivity of hPINK1 enzyme are still not clear and may be due to instability as also pointed by another referee. Therefore, we have removed the “activation mechanism” from the title and Abstract. We have also included new experiments in the revised manuscript including mutational analyses in hPINK1 enzyme as described above separately in response to Editor’s comments. We agree that understanding how hPINK1 is activated is interesting but further work will be required to decipher the activation mechanism for hPINK1 and is beyond the scope of this report. We understand the reviewer’s concern about PINK1 stability, therefore, we have performed thermal denaturation assays on the mutants. The thermal shift assay data does not show any significant changes in the stability of mutants suggesting that the effect of Ins3 on substrate recognition is not due to instability of the mutant enzymes (Author response image 3). Furthermore, we have established that TcPINK1 can trans-phosphorylate other TcPINK1 molecules (kinase-inactive variants) and used this assay to show that Ins3 deletion does not impact on TcPINK1 trans-phosphorylation but does prevent ubiquitin phosphorylation. We think that the TcPINK1 trans-phosphorylation is more physiological than generic substrates and peptides and have presented this in the final analysis (Figure 2). This work was funded by a Wellcome Trust Senior Fellowship to MMKM. (101022/Z/13/Z), the Medical Research Council and a joint MMKM and DMFvA grant from Parkinson’s UK (G-1506; Fife and Ayrshire Parkinson’s UK Branches). DMFvA is funded by a Wellcome Trust Investigator Award (110061). We thank Prosenjit Pal for assistance in identifying PINK1 disease mutants. We thank the European Synchrotron Radiation Facility for time on beamline ID23-1. 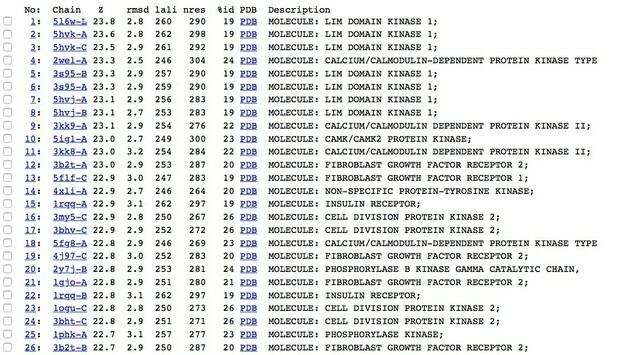 Coordinates and structure factors have been deposited with the PDB database (PDB ID 5OAT). We thank Dr. Yogesh Kulathu & Prof. Helen Walden for useful discussions. We also thank excellent technical support provided by MRC Protein Phosphorylation and Ubiquitylation Unit (PPU) DNA sequencing service (coordinated by Nicholas Helps), the MRC PPU tissue culture team (coordinated by Laura Fin), the MRC PPU reagents and services team (coordinated by Hilary McLauchlan and James Hastie), and Axel Knebel. We also thank Mark Dorward for preparing crystal screening plates. © 2017, Kumar et al.